Attention Michigan builders and remodelers! As I’m sure you’ve heard, the State of Michigan will begin enforcing the new 2015 Michigan Residential Code on February 8, 2016. As part of this new code, the State has adopted the 2015 edition of the International Energy Conservation Code (IECC), edited appropriately for Michigan buildings. The addition of the 2015 IECC code has many Michigan builders and contractors calling us with questions so we thought we would put together a quick list of new requirements that everyone will have to incorporate beginning February 8th. As stated above, the 2015 IECC has been adopted as part of the Michigan Residential Code. The good news is that for the first time in 15 years, builders are now able to purchase one comprehensive code book instead of two or more. 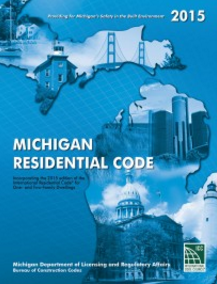 Click here to purchase the new 2015 Michigan Residential Code, including the 2015 IECC. The Blower Door Test (BDT) is designed to find the source of air leakage in new homes (post-construction) or existing homes (prior to remodeling). The 2009 IECC offered contractors the choice between a visual test and the blower door test, allowing for flexibility. However, the 2015 IECC requires a BDT on all residential new construction. Furthermore, to avoid conflict of interest, builders and contractors are not permitted to perform their own BDT’s and must hire an independent 3rd-party to complete the testing, average cost running between $250 – $450 USD. When finishing or remodeling existing basements to create additional living space, builders must install egress windows in any basement room that is designated as a sleeping room. Egress windows are no longer required when basement finishing or remodeling is limited to laundry rooms, family rooms, exercise rooms, etc. NOTE: All counties and local municipalities interpret this code differently. It is always a good idea to contact your local Building Inspector to find out how codes are enforced and interpreted. The required locations for the carbon monoxide alarms remains unchanged from the 2009 IECC. In previous versions of the Michigan Residential Building Code there was only one sentence regarding deck construction. The new 2015 code provides more than 4 pages of instruction on how to properly build a deck. These are just a handful of the topics covered in the 2015 code book. This entry was posted in All Industries, Architecture, Code Officials, Construction, Electrical, Real Estate.